Genea-Musings: Dear Randy: Should I Change to a Different Program, and/or Put My Tree Online? Dear Randy: Should I Change to a Different Program, and/or Put My Tree Online? 1) I have been using Family Tree Maker for years. Would it be better to use another program or an additional program as well? If so, would the info transfer easily to another program? 2) Should I be putting my info online? If so, where? 1) Family Tree Maker is a very mature genealogy family tree program, and has almost all of the features of other family tree programs. Since you have a lot of experience with it, I suggest that you stay with it rather than have to learn how to use all of the features, procedures, and quirks of another program. If you did use another program, such as RootsMagic or Legacy Family Tree, then you can export a GEDCOM file using Family Tree Maker and import the GEDCOM file to the other program without loss of information, with the exception of special formatting and custom facts. If you have attached media (images, text, audio, video) in Family Tree Maker, then the links to those media items should transfer in a GEDCOM file. The current Family Tree Maker 2017 program can synchronize your complete FTM file with an Ancestry Member Tree, and can interact with the FamilySearch Family Tree. FTM 2017 enables the user to add Ancestry Member Tree information (names, dates, places, relationships, media, notes, sources, etc.) to the profiles in FTM. Other programs can do this - for instance, RootsMagic 7 TreeShares specific profiles with an Ancestry Member Tree, can add Ancestry Member Tree information to specific profiles using WebHints, and can exchange information with profiles in the FamilySearch Family Tree. There are reasons to use another program other than the one you are using. Another program may do a better job making reports or books, creating charts, interacting with a website, etc. For instance, I use the Legacy Family Tree program to create reports and books because I prefer their formatting over RootsMagic and Family Tree Maker. Another program may be much easier to use, or creates better sources, and that is the reason I chose to use RootsMagic in 2006 after using Family Tree Maker for about 15 years. Any change creates a learning curve, and it took me several years to get up to speed on RootsMagic. * If you upload a GEDCOM file, or synchronize your tree, with an Ancestry, MyHeritage or Findmypast family tree, then the online tree will quickly generate Hints (on Ancestry), Record Hints (on FamilySearch), Record Matches (on MyHeritage), and Hints (on Findmypast). These Hints are usually records that may apply to a specific person in your tree (with about an 80 to 90% accuracy rate) - they are low hanging fruit, if you will. You should still search on the record provider sites (Ancestry, FamilySearch, MyHeritage, Findmypast, etc.) because the sites may not find all of the records for your person. * If you add your family tree information to a "unified tree" web site like WikiTree, Geni, or FamilySearch Family Tree, then you may be able to find information (dates, places, events, sources, notes, media) about your tree profiles that other people have contributed to the unified trees. These trees, and the information in them, don't belong to "me" or "you," it belongs to all of us. It may get changed and the profile be improved, or it may get changed and the profile be made worse. * With your tree online at any one (or all of them!) of the online tree providers, other researchers may find your profiles when they search the sites using person names, birth years and places, death years and places, spouses names, etc. They may then communicate with you via the website message system, or via email, and you can share information with them. They may have more or better information than you have, which you should critically analyze before adding their information to your tree profiles. ** If the information for a profile is wrong or incomplete, then another researcher may contact you and challenge your information or, hopefully, provide better information. It can be embarrassing. ** Another researcher may copy your information without checking your sources and notes, and if your information was wrong, they will have then propagated that wrong information to others. ** Another researcher may copy your media items (e.g., family photographs, cemetery photographs, document images, etc.) and notes and put them in their own trees without advising you or asking permission to use them. 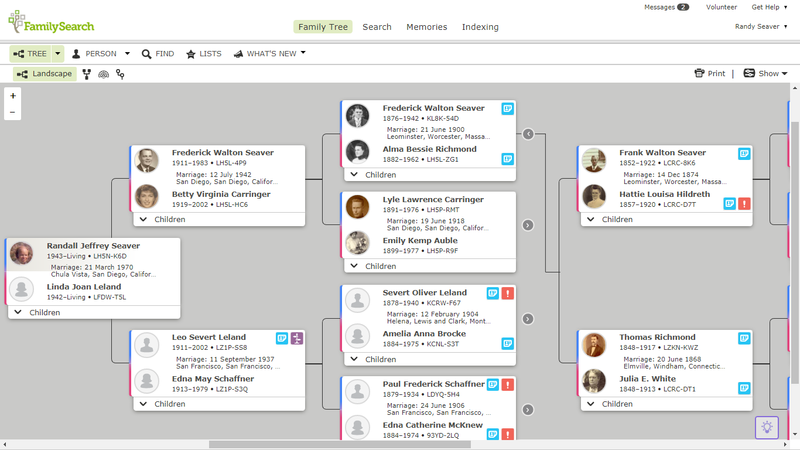 3) The information you put into any family tree program or online tree should use standard formats for names, dates and places, and should have sources for the events that describe a person's profile. The sources should be for records that provide evidence of the events in a person's life, or authoritative derivative material from books, periodicals, websites, etc. that are sourced by the authors. There are many resources available in repositories or online that are not on Ancestry, FamilySearch, MyHeritage, or Findmypast. FamilySearch has billions of records in unindexed digitized record collections (like probate, land, town, tax, church, and other records). County record offices, county and state courts, state and national archives, historical and genealogical societies, newspapers, school districts, businesses, and many more entities have many records that have not been digitized. 4) I hope this answers Win's questions. What would my readers add as advice to Win about his questions? One online tree I do like is Rootsfinder. It is a separate tree site but gets hints from multiple genealogy sites and can import the data using their web clipper app. It is shareable but it is yours to decide what to do with so it avoids problems that come with one giant tree that Family Search has and it can't be copied over and over like Ancestry and other trees when bad info gets spread everywhere.